The localization support for Examples\progressarea-localization\ lets you completely translate the user interface, or simply adapt a few strings. This technique is useful when customizing some of the messages of a particular instance. The messages are not shared between ProgressArea instances. A complete translation using this approach is not appropriate. 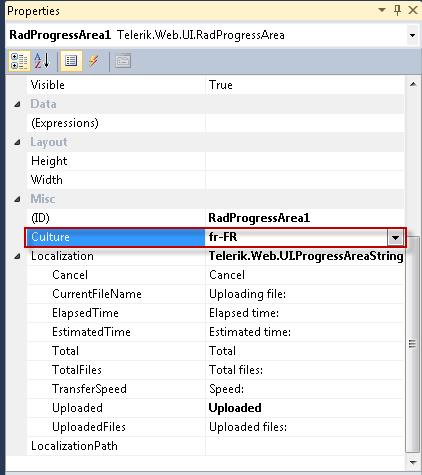 "Uploaded" "Uploaded" Labels the Total Progress Percent value.This label does not appear when ProgressIndicators does not include "TotalProgressPercent"
"Total" "Total" Labels the Request Size value. This label does not appear when ProgressIndicators does not include "RequestSize". "UploadedFiles" "Uploaded files:" Labels the Files Count Percent value. This label does not appear when ProgressIndicators does not include "FilesCountPercent". "TotalFiles" "Total files:" Labels the Selected Files Count value. This label does not appear when ProgressIndicators does not include " SelectedFilesCount ". "CurrentFileName" "Uploading file:" Labels the Current File Name . This label does not appear when ProgressIndicators does not include "CurrentFileName"
"TimeElapsed" "Elapsed time:" Labels the Elapsed Time value. This label does not appear when ProgressIndicators does not include "TimeElapsed". "TimeEstimated" "Estimated time:" Labels the Estimated Time value. This label does not appear when ProgressIndicators does not include "TimeEstimated". "TransferSpeed" "Speed:" Labels the Speed value. This label does not appear when ProgressIndicators does not include "TransferSpeed". "CancelButton" Cancel" Labels the Cancel button. This label does not appear when DisplayCancelButton is False . The primary means for localization in ASP.NET is to use resource files. Resource files are simple XML files that can be easily edited and transferred to other applications. 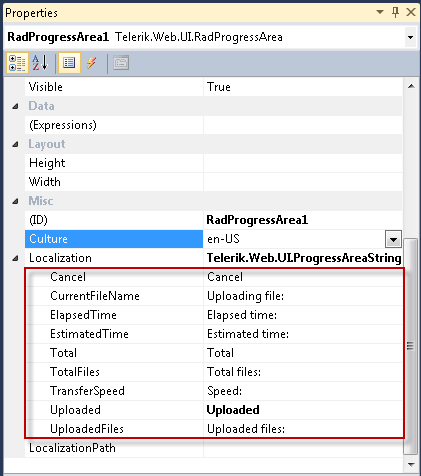 You can use resource files to change the default (English) localization for Examples\progressarea-localization\ that is stored in the Telerik.Web.UI assembly. 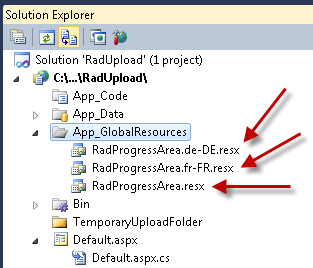 Create the App_GlobalResources folder in the root of your web application. Copy the default resource Examples\progressarea-localization.resx file into it. This file can be found in the App_GlobalResources folder of the directory where you installed the RadControls. Make sure that the ReservedResource message is preserved. It is used for identification purposes and is never displayed.